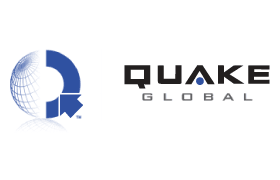 Quake Global is a leading manufacturer of satellite modems for the ORBCOMM®, IRIDIUM®, INMARSAT, and GLOBALSTAR satellite networks. QUAKE also manufactures satellite/terrestrial modems with optional GPS and cellular technologies. The modems from Quake Global enable the tracking and controlling of a wide variety of valuable assets located virtually anywhere on earth. Major applications include asset tracking for heavy equipment, aviation, maritime, trucking, rail, utilities, oil & gas, military and government. Quake Global provides high-quality satellite modems to many leading customers including CATERPILLAR, HITACHI, KOMATSU, VOLVO TRUCKS, VOLVO CONSTRUCTION, XATA, AVIDYNE among many others.